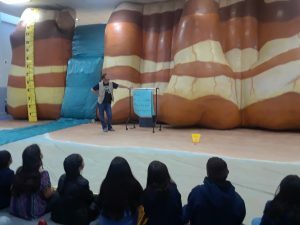 KATY, TEXAS – SparkPoint Innovations had a blast with students at Sheridan Elementary School with Rocky the Big Canyon Balloon. We were just able to fit perfectly into your gym for a fun day of geology! We enjoyed teaching the 4th and 5th graders – saw some kids looking sharp on picture day! Thank you to the teachers who helped with the program and Thanks for having us out to your school today! Good luck with your upcoming STAAR test! You guys are going to rock it! Hope to see you again in the future!